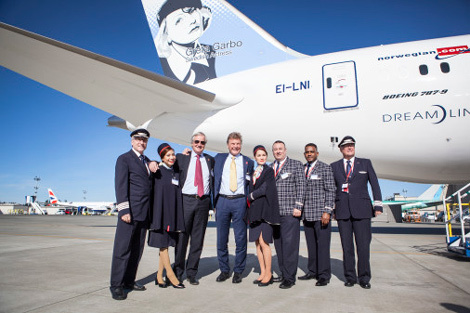 Norwegian is the first airline in the Scandinavian region to use the Boeing 787 on its long haul network. This title continues with the introduction of the stretched version of Boeing Dreamliner into its fleet. Norwegian has 50 Boeing 787s in its order book. All of them are leased from various companies such as MG Aviation and ILFC to lower costs. The airline is headquartered in Oslo, Norway and with the most flights operated out of Oslo Airport (OSL). The airline uses Stockholm Arlanda Airport (ARN), Copenhagen Airport (CPH), and London Gatwick Airport (LGW) as bases for its international operations additionally. Its route network is mainly to leisure destinations such as Bangkok’s Suvarnabhumi Airport (BKK) and North American cities. The airline is classified in the low cost category where passengers are treated with lower prices in return for small seat pitch, lack of in flight entertainment options, and lack of complimentary inflight meals. However, it is the only low cost carrier to have free WiFi on board for all passengers. Not surprisingly, Norwegian configured its Boeing 787s with higher density. The -8 has 291 seats while the -9 expands total by 18% to 344 seats. The -9 seat counts are approximately 15-20% higher than configurations from a network carrier (Insight – Boeing 787-9). It is not the densest as All Nippon Airways places 395 seats on this variant for its domestic flights. Norwegian will use this aircraft on the only non-stop flight OSL to Orlando International Airport (MCO) on March 5, 2016. This weekly Saturday service will leave OSL at 1145am and arrive MCO at 1600 on the same day. The late morning departure time will have time to pick up morning feeder traffic. The return will leave MCO at 1800 and arrive OSL at 0855 the next day which is ideal for connection to other European cities. Additional -9s will be based out of London Gatwick Airport for future routes to Southeast Asia, North American and South America. Norwegian will not be the only airline in the region serving Florida.Scandinavian Airlines System (SAS) will start flights from both CPH and ARN to Miami in Fall 2016 (News – SAS Expands International Network) on board Airbus A330s.